Charles Town, West Virginia, 1990. On March 10, 1771 George Washington dined at Piedmont. By 1989, Piedmont was a house that time and man had overlooked. Consisting of a whitewashed stone wing (1735) with an attached red brick manor house (1780), it was without a kitchen in the main house, had one bathroom and but a few of the rooms had electricity. Only five of the 10 rooms in the main house were heated. Covered with ivy and an irreparable red tin roof, it was surrounded by deteriorating sheds, chicken coops and farm debris. Its garden was overgrown and abandoned to weed trees two to three feet in caliper. 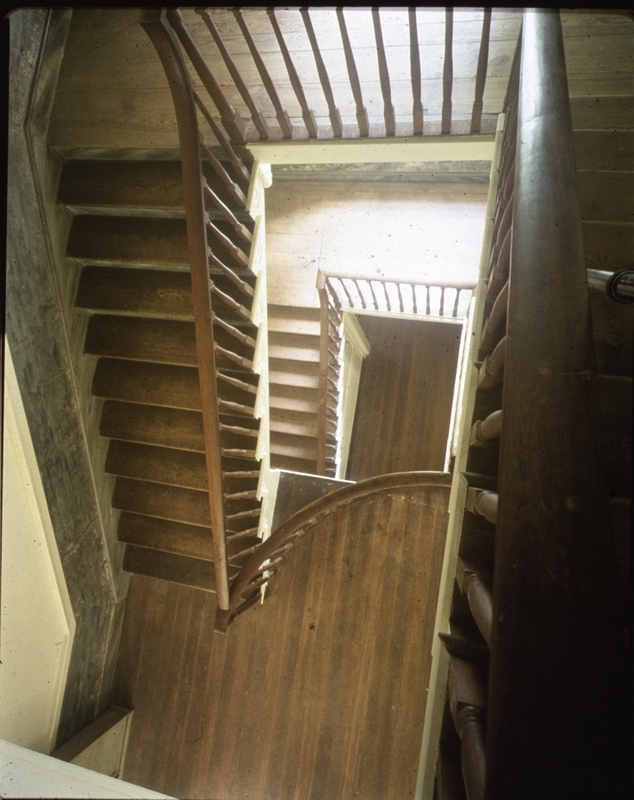 The interior woodwork, while extant and extensive, was covered with many coats of paint. Deliberate effort was made by the architect to evoke the spirit of the 18th century while attempting to bring this beautifully proportioned house gently into the 20th century. Care and restraint were exercised while constructing a nearly invisible HVAC system, modern bath, total rewiring and a contemporary kitchen. All appliances and 20th century necessities , save the large restaurant stove, are hidden behind the unique 18th century paneled cupboards serving all but one of the eight dwelling rooms on two floors. The original colors of the paint and faux treatment of all doors were arrived at through analysis by the respected historical paint consultant, Frank S. Welsh. The floors were left unfinished and natural. The 1800 wallpaper in the drawing paper in the drawing room was re-glued where detached and cleaned rather than made to look new. The new master bath was fitted with an architect-designed, freestanding copper tub and a hidden, compartmented W.C., while the washbasin shares space within the newly designed, freestanding antiqued armoire. The 1735 spring and smoke houses were completely restored using original timbers, while some seven or eight sheds and 20th century incidental wooden buildings within the immediate area of the house (some were actually lean-tos attached to the house) were removed. During these initial stages, the 19th century porches serving both major facades were removed and replaced with researched 18th century porches. The two benches that are visible in the photographs are contemporary, based on designs by Thomas Jefferson. Piedmont is on the National Register of Historic Places. Publication: Elle Decor : Historic preservation.